As its name would imply, the Steady Stream 2 is claimed to provide “a continuous stream” of water using the proper priming/firing technique, thanks to the internal spring assisting the user in providing a continual “push” in between pumps (with a fraction of the pumping energy, in turn, being used to power the spring). It’s a rather intriguing system that mostly functions as intended, though with results that are perhaps somewhat less impressive than imagined. 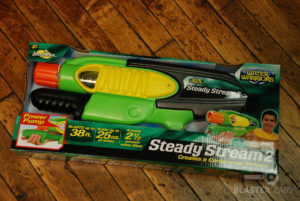 In fact, during most of our testing using the Steady Stream 2, we didn’t really notice any significant advantage over water blasters using other technologies. It was only when we timed the pumps just right that we were able to produce what amounted to a more or less “continuous” stream. 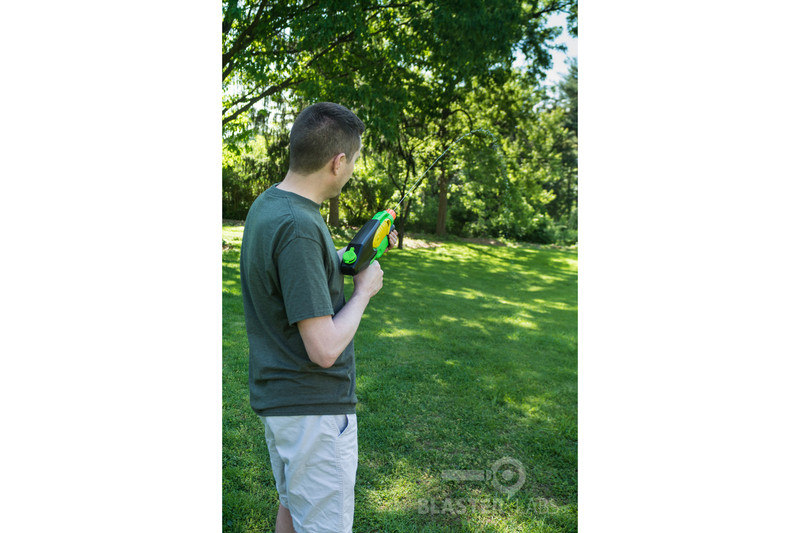 But frankly, we had a noticeably more continuous stream when we tested the Colossus 2, which uses a completely different air pressurization system, and that only requires the user to hold the trigger and keep pumping. Perhaps some users would find more value in this functionality, but since it didn’t happen easily and consistently with most shots, we were a little underwhelmed. But that doesn’t mean the Steady Stream 2 didn’t still have its strong points. 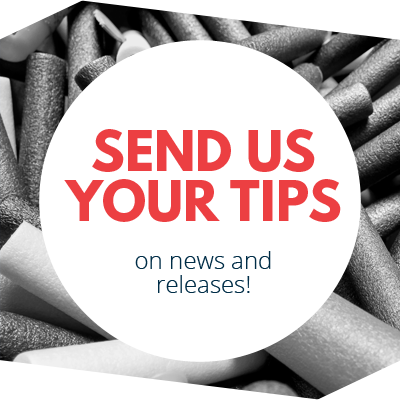 When testing a blaster of any type—foam, disc, water, IR, etc.—ergonomics and design are critical. And here, the Steady Stream was a big winner. 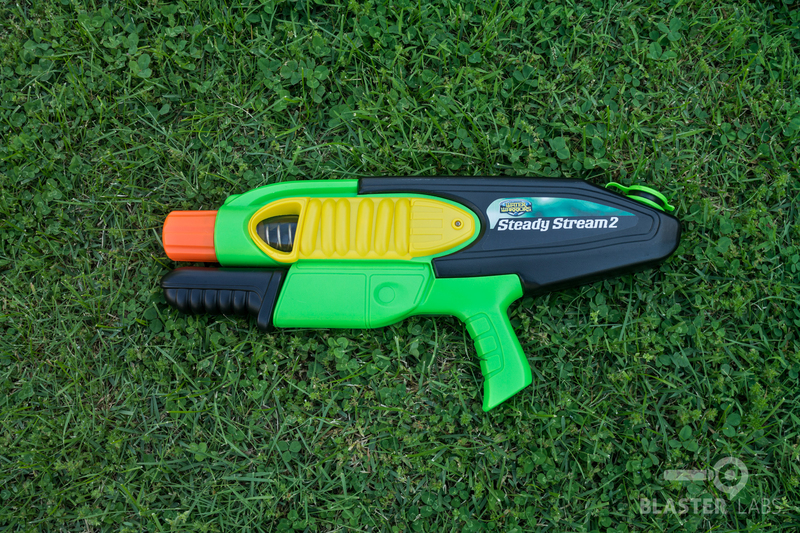 Being considered a “mid-weight” blaster with its modest size and 25 ounce water capacity, we found the Steady Stream 2 to be both comfortable to hold, and reasonably well-balanced. We also found it easy to pump, easy to refill, and uncomplicated to use. The lack of gimmicks like multiple nozzles, clips, motors, angle meters, etc. made this blaster a straightforward joy to hold and fire. In fact, it’s so easy to operate that it’s rated for children as young as 4 years of age. 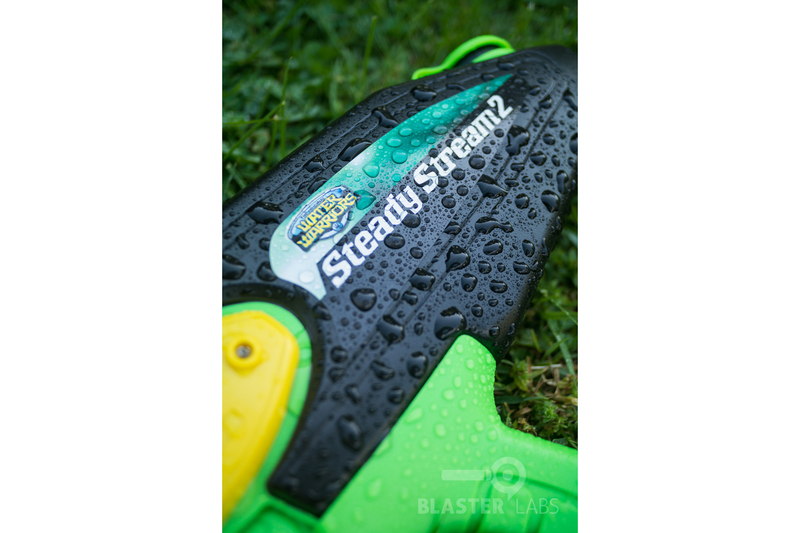 When it comes to actual blasting performance, the Steady Stream 2 wasn’t necessarily astonishing, but we did find its single stream to be both thicker and more powerful-feeling than, for instance, the short blasts created by the motorized Super Soaker Hydrostorm, or even the big, bad Colossus 2 and its range of selectable nozzles. A full pump resulted in a strong water output, even if the distances were underwhelming at a max of 31 feet (more than a few feet shy of the 38’ claimed on the box), and a median range of several feet below that. 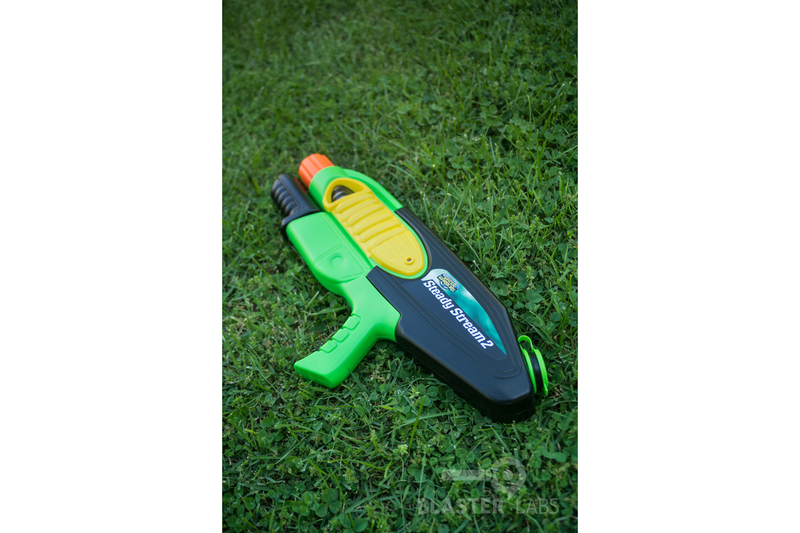 This isn’t a blaster that will let you snipe at long distances and avoid taking hits, but if you’re at close range and going one-on-one, we’ve yet to find a water gun that will significantly out-drench it. 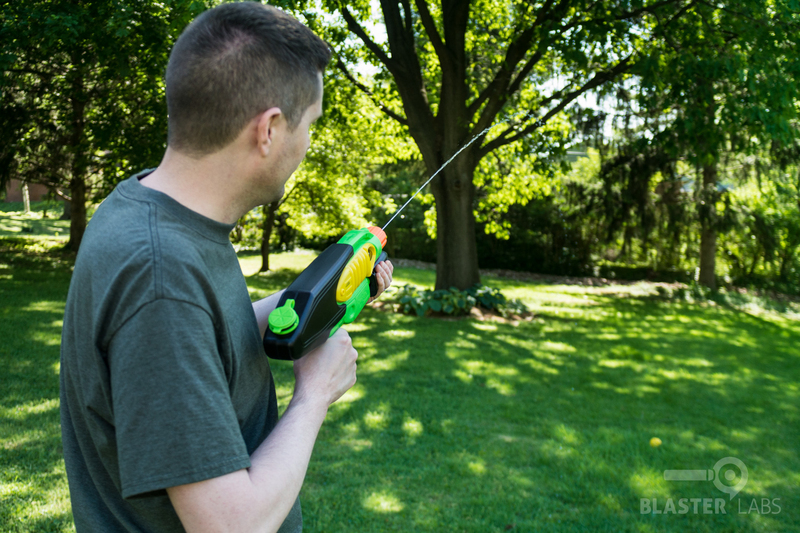 Elements that we took issue with were largely the same as what we’ve said about many Buzz Bee products, including aesthetics that, while an improvement on prior models, are still on the low-rent, overly-rounded side of things, and build quality that is a notch below the competition. On that last point, we took particular notice of a reservoir cap that leaked when the Steady Stream 2 wasn’t held level (there’s no valve on the no-frills, tethered cap), and thin plastic sidewalls that creaked when squeezed or held tightly from the top. We also found that the pump handle was capable of being rotated 360-degrees on its axis, allowing for situations where the handle could be positioned completely upside-down, such that the finger stop would prevent the handle from being pulled inward toward the body until the handle was reoriented. And we’re never thrilled about design evolutions that take a step backward—in this case, a water reservoir that actually holds less water than the original Steady Stream (25 oz. vs. 37 oz. )—especially if there’s not a huge aesthetic or ergonomic benefit. 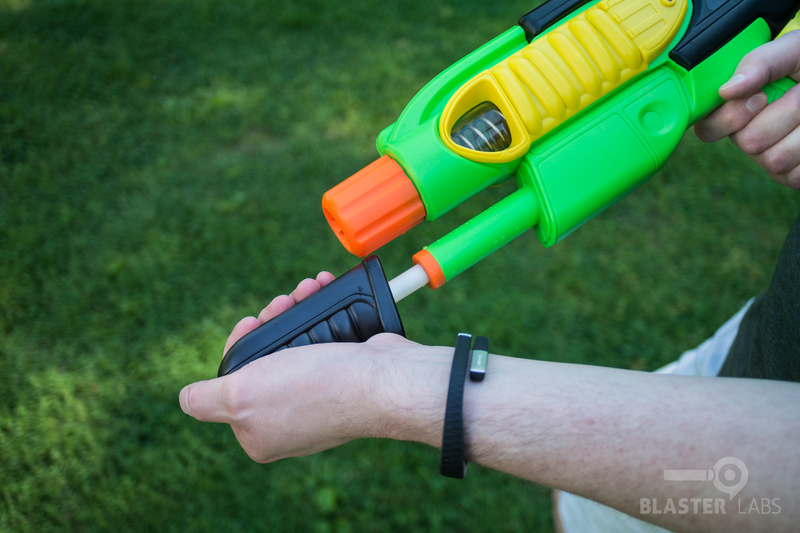 Lastly, we’d like a trigger… yes, it’s common for water toys not to have triggers. But we always, always want a functional trigger, all else being equal. In total, if we take a moment to look past these minor gripes, the overall feeling we have about the Steady Stream 2 is that’s it’s still a reasonably well-rounded performer. The simplicity of design makes it both easy to use and very likely to survive years of rough, backyard use. 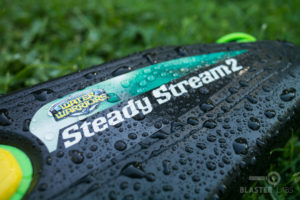 It isn’t going to intimidate other players with its size or features, and it’s true that the performance of the Steady Stream 2 is a little underwhelming. But it’s built to last, and produces a strong, thick stream that soaks other players in a single shot. It’s also very easy to handle, simple to fire, and absent any frivolous gimmicks. 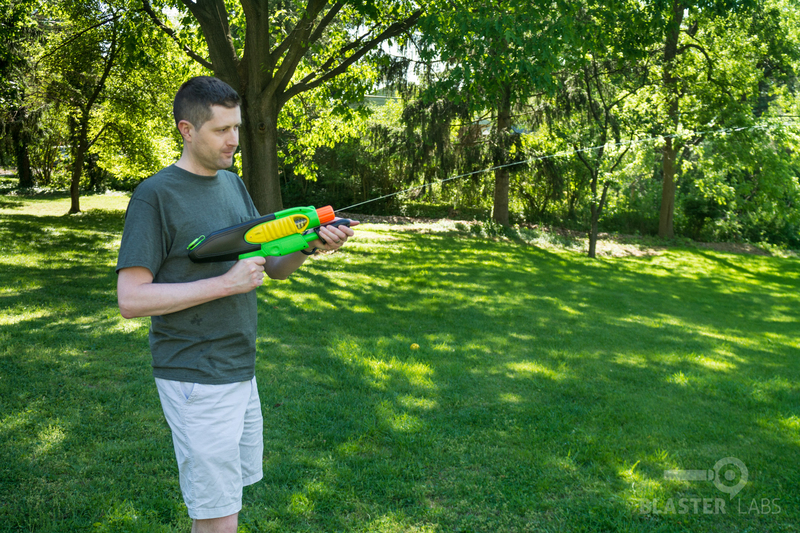 We went in to this review thinking the spring-assisted, near-continuous blasting performance would be this water gun’s raison d’etre. And while that technology does make it unique, it turns out that simplicity and reliability are the factors that really make the Steady Stream 2 the standout it is. The SS2 is a mid-weight blaster? Oh brother…that class generally holds 1,700-2,400 mL in the reservoir and weighs 6-10 lbs when full or overloaded. The SS2 is squarely in the light class, and that is generous when the class includes things like the XP 150, holding around 1,500 mL and weighing 5.5 lbs full, 7 lbs overloaded. The SS2 doesn’t even weigh a whole pound full. Unfortunately, I don’t think these will last very long even with their simple design. Buzz Bee cheaped out on the components. You can feel it in the plastic and see it with rust forming on the internal metal parts after only a couple years, which is unheard of among quality water guns. A well-used SS2 will creak heavily when you touch the reservoir. 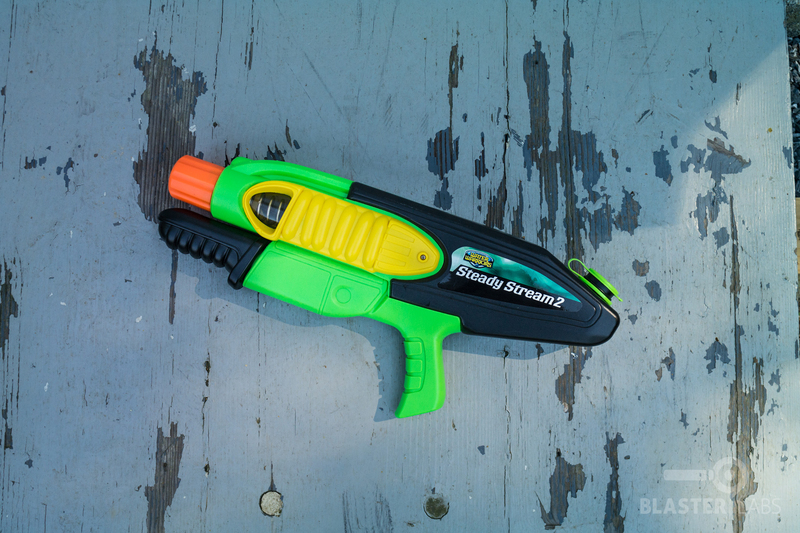 I would still take this against any Nerf Super Soaker in a soakfest, though. Thanks for the comments, Robert. 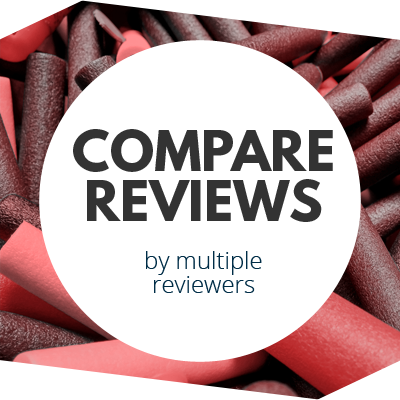 Although we do our own testing and all opinions are our own, we do follow iSoaker.com’s conventions for water blaster classes. They have defined the Steady Stream 2 as a “midweight back-up” class, and the weight when filled (3 1/4 lbs.) falls right into the “Medium” class that they define in their glossary as 2.2-4.4 lbs., when full. It was from those two classifications that we deemed it “medium.” As a primary blaster, however, we would agree it could be considered to be in the “Light” class. 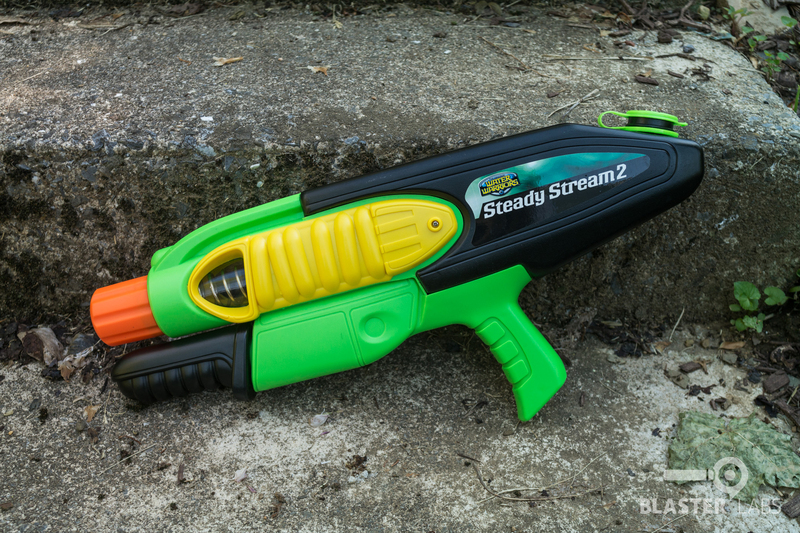 Also, we have both a brand-new Steady Stream 2 and a roughly 2-year old Steady Stream 2 on-hand, and we’d be hard-pressed to observe a difference between the two. Although we have taken Buzz Bee to task in the past for build quality concerns (as we have also done in this article), we haven’t seen the rust formation or other concerns you noted. 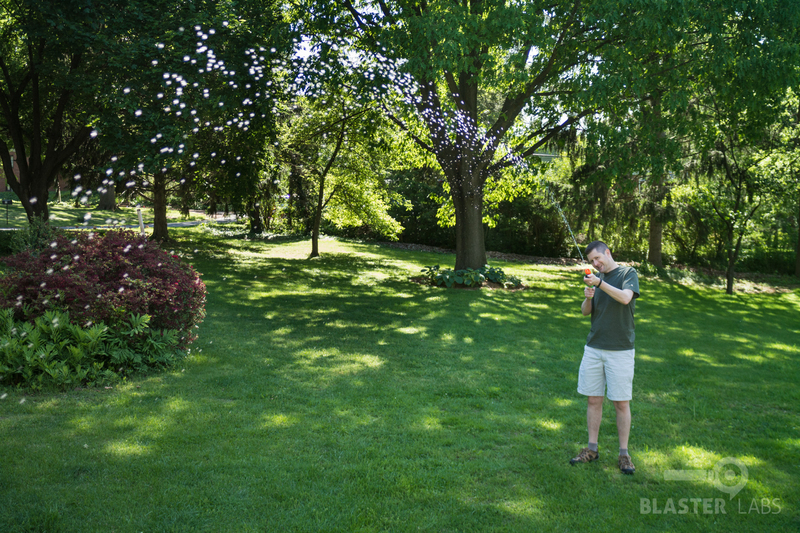 Individual use and care will vary, of course… our blasters are adult-owned and used, and are never left in the elements. 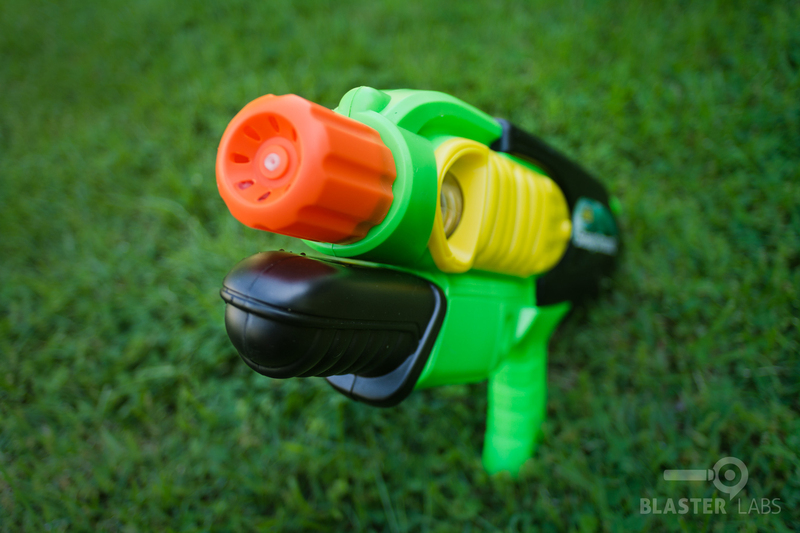 Most water blasters owned and used by children are not so lucky! 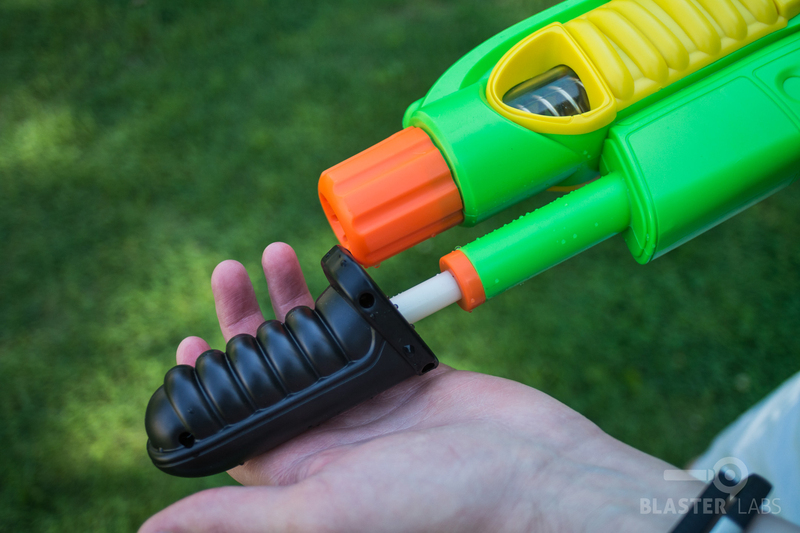 I think that water guns that you have to pump up need that small hole in the lid. I don’t know for shore but all of my water guns have that hole in the lid. P.S this is an amazing and helpful website, keep it up blaster labs!